Enrolments for 2015 will take place at our studio, Unit 7/ 74 Mountbatten Drive on Sunday, 18th January, 10am - 2pm and Friday, 23rd January 4-7pm. We are so looking forward to seeing you all. If you will not be in town on this day we would ask that you would still indicate your intention to enrol by this date. Enrolment forms will this year be available at our Enrolment Day or online at our website. Most exciting of all, our new software program allows you to enrol and pay online. We are also very excited to inform you that we are now working in conjunction with EziDebit to give you even more payment options. If you are going to be away on this day, please email us or check our website for our online enrolment and payment facility. Your enrolment form and payment can be forwarded to us by post to P.O Box 2796. We ask that your enrolment fee of $25 per individual or $30 per family is paid on Enrolment Day to secure your place. We will also be offering a 10% Early Bird Discount for any student wishing to pay their Term 1 fees at our Enrolment Days. Your receipt will be issued to you at Enrolment for your Term’s fees. Methods of payment available on this day include cash, cheque and credit/ eftpos facilities. There will also be comprehensive handbooks available at our Enrolment Days outlining everything you need to know about Stepping Out Dance Factory and these are invaluable to our new families. 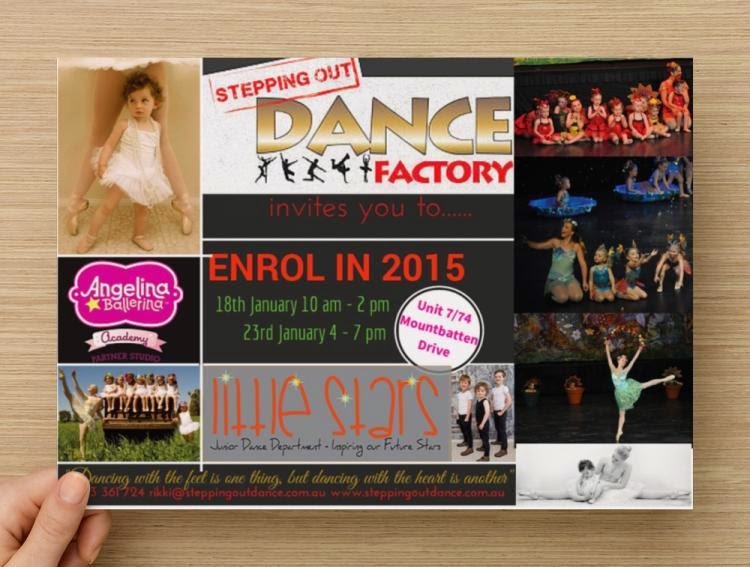 The Timetable for 2015 is now on our website www.steppingoutdance.com.au . We are also asking for students to indicate interest in Eisteddfod participation by this date. If you are interested in being involved in Solo or Troupe work please ensure that you let the faculty know at Enrolment. We are hoping to offer Performance groups for all ages across all dance styles. We strongly encourage our students to consider being a part of an Eisteddfod Performance Group in 2015 as this provides lots of fabulous opportunities for students to develop their skills, form friendships and have FUN. Private Lessons are available during the summer holidays. Please contact Rikki on 041 3361724 if you would like an early start to your routines for the year. Classes for 2014 include Classical Ballet, Jazz, Hip Hop, Stretch, Tap, Little Stars Ballet & Jazz( we can not rave enough about the wonder of the Angelina Ballerina Programme- more classes will open during the week and during day time slots with interest so please indicate your most ideal time so we can see if we can cater to it) Performance, Modern/Contemporary & Pointe. WE ARE SUPER EXCITED TO ANNOUNCE THAT THE ADDITION OF NEW STAFF ALSO MEANS WE ARE ABLE TO OFFER MORE CLASSES AND THAT DRAMA IS BEING ADDED TO OUR CURRICULUM IN 2015. We will also have a BOYS ONLY class and age specific classes for our Tiny Tots curriculum. In our commitment to create ease for our studio families, we have implemented a brand new dance management software program that is now accessible within our website. This program enables users to create their own log in, enrol, pay invoices and make online purchases. Merchandise for 2015 includes delightful Starter packs for the Angelina Programme, Stepping Out tank tops, bags, drink bottles and your general dance wear supplies. For very competitive prices, we urge you to check out our online store. Don’t forget all of your dancing requirements are available through our in-studio shop. Orders can be taken at Enrolment Day. WE will also be taking orders for brand new studio jackets and tracksuits at this time. Don’t forget that your child’s love of dance can be celebrated at Stepping Out Dance Factory’s Birthday parties. Imagine your child’s special day being combined with their love for dance?! Party themes include Angelina Ballerina, Hip Hop Dance Party ,Rock star and other assorted themes suited to your individual child’s interests and dreams. Please contact the Directors for more information on how we can best cater to your special day and take the fuss out of your next party. Don’t forget to check out the website, www.steppingoutdance.com.au and click on the News section for your relevant area. Stepping Out is also on Facebook so be sure to hit LIKE on our page for all the latest news and pictures. There is always something hot off the Factory Floor. We welcome your calls or emails for additional information. Call Rikki on 0413 361724 or email rikki@steppingoutdance.com.au Looking forward to seeing you or hearing from you by the 24th January!